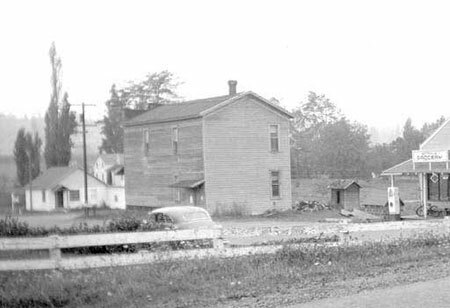 The community that has been called Butteville since the mid-1800’s received its name because it sits at the base of the eastern end of La Butte, a small basalt outcropping next to the Willamette River in north French Prairie. La Butte is a French term (mound, hillock) that was given by French-Canadian trappers working for the Hudson Bay company in the 1820’s to 1830’s. Those French-Canadian trappers were the first non-Native settlers in Oregon and French Prairie, many of them settling here when they retired from their time as fur trappers. The community they formed came to be called Butteville. Native Americans, specifically the Kalapuya lived in French Prairie for at least 8,000 years before the arrival of white settlers, and subsisted in a traditional hunter/gatherer lifestyle that included burning open prairies to foster growth of camas roots and tarweed seed. They gathered acorns, nuts and berries. They also needed access to the river for canoe transportation and to fish for salmon. Kalapuya stone grinders have been found in the area, confirming semi-permanent use of this area that contained a stream for water, easy access to the prairie on the south, and direct access to the Willamette River. 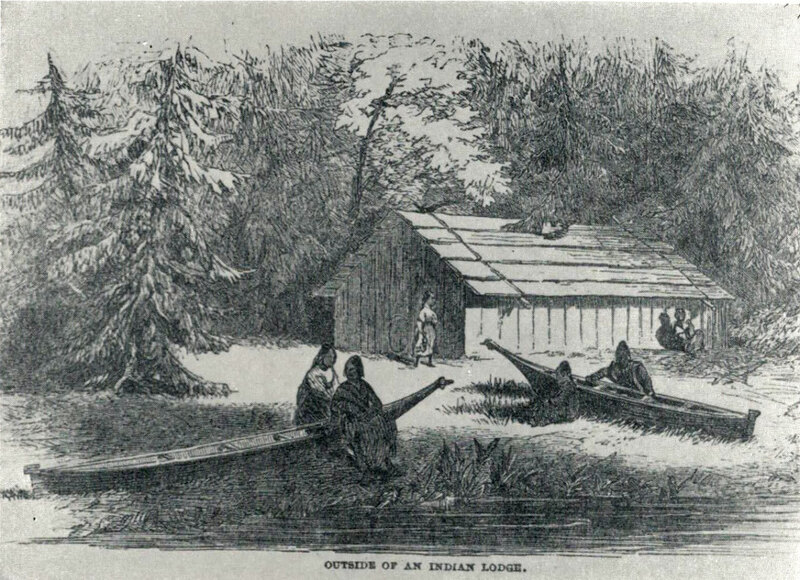 Outside of an Indian Lodge: A gabled house; river canoes on the bank. The town of Butteville was, in the early 1800’s, just a docking point of convenience for the very few river travelers adventuring up river. Most of the river traffic was canoes or flat boats which were in the beginning the only mode of transportation as there were no roads. The river defined the boundary of what is now the French Prairie. 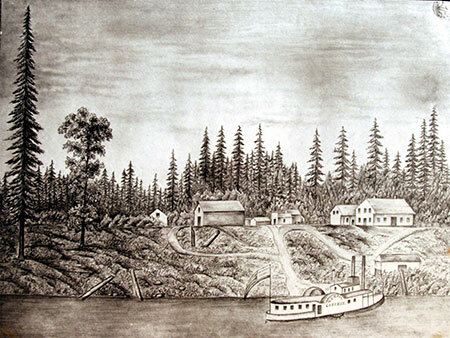 The Willamette region upriver of what is now Oregon City and previously Willamette Falls was first controlled by the Hudson Bay Company (HBC) as a trapping area for the Company’s trading post in Fort Vancouver. 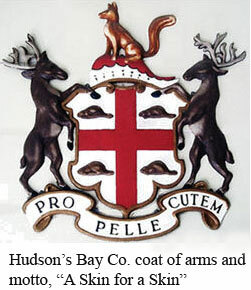 The HBC merged with the American Fur Trading Co. which had established a trading post at Astoria (Fort George). Another company , The Northwest Trading Company, landed via the Columbia River and became the HBC’s greatest competition. HBC moved the trading post at Fort George to Ft Vancouver in 1825 and soon became a monopoly in the area. Retired employees from these fur trading companies were the first non-Native residents to be found in the French Prairie area. 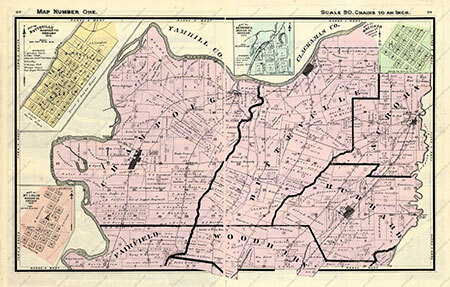 Before Butteville became a town it was surrounded by French speaking claim holders. In 1840 Alexis Aubichon, a French Canadian retiree from the HBC settled adjacent to the river at a location which would now be in the west half of Butteville. 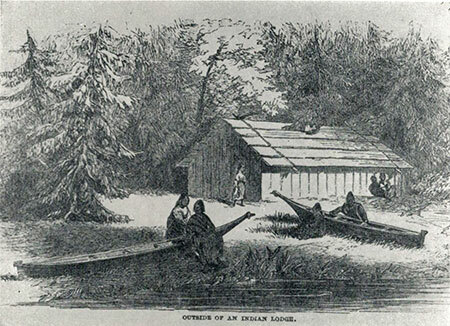 He constructed a landing that was to become “Obeshaws Landing.” This landing was referred to in the journal of John Frost In September 28, 1840. This is the first recorded writing about the settlement (OHS, Vol 35-63). Over time, this landing had a huge presence in the development of Oregon. It was ultimately called Butte Landing. A drawing of the original Alexis Aubichon Home on his Donation Land Claim east of La Butte in the town of Butteville. This drawing was prepared by John Dunn and submitted to Surveyor General John B. Preston in April, 1883. Note: the stern-wheeler Canemah pulled up at the Butteville Landing. On the East side of Aubichon’ s claim, another French Canadian and Hudson Bay Employee , Joseph Laferte took claim of property making up the other half of Butteville. Both of these claims were recorded in 1846 as Territorial Land Claims, and later re-filed as Donation Land Claims. In 1846 Francis Xavier Matthieu, who became a leading citizen, filed a Donation Land Claim southwest of the town. Map of Donation Land Claims in the Butteville area. The Willamette settlement of Butteville was initially referred to as “ La Butte” or often just called “ Butte”. Joel Palmer noted in his Journal of 1845 that “eight miles from Pudding River is a village called Buttes….there were but a few cabins in it when I left. The proprietor had erected a warehouse to store wheat they might purchase of the settlers…at this place are some conical hills called Butes…” This name was likely assigned by French speaking retired trappers and employees of the HBC travelling the river and using the Butte as a landmark. An upriver trip from Willamette Falls was slow, a full day of travel which required docking in the area, due to darkness. The Butte was a sentinel to the French Prairie rising 417 feet above some of the most fertile land in the United States. This name was used throughout the mid 1840’s. Joel Palmer also wrote about the Butte: “it was laid out by George Abernathy and Alanson Beers of the Methodist missionary forces.” (names that would figure prominently in Oregon’s history). This surveyed layout would soon become the plat of the town of Butteville and was really important in the future and development of Oregon. Land in this area followed the British rule of government. There was little guidance for settling claim disputes and, as more settlers arrived seeking their fortunes from the East, this became a problem. The Hudson Bay Company had control of virtually every aspect of the production and sale of agriculture (primarily wheat) from the Willamette Valley. They controlled the price, the methods of shipping and the processing of flour. They also, for many years, had the only trading post located in Fort Vancouver. Commerce at that time was conducted by trade and barter of a mixture of agricultural products and furs in exchange for goods and services. Wheat grown on the French Prairie had to be delivered to the Hudson Bay Warehouse in Champoeg. For this, a receipt was granted which passed as money for its face value to be exchanged for goods or hardware at Ft. Vancouver. It wasn’t until 1841 that the first non-HBC trading post or mercantile was opened in Oregon City. 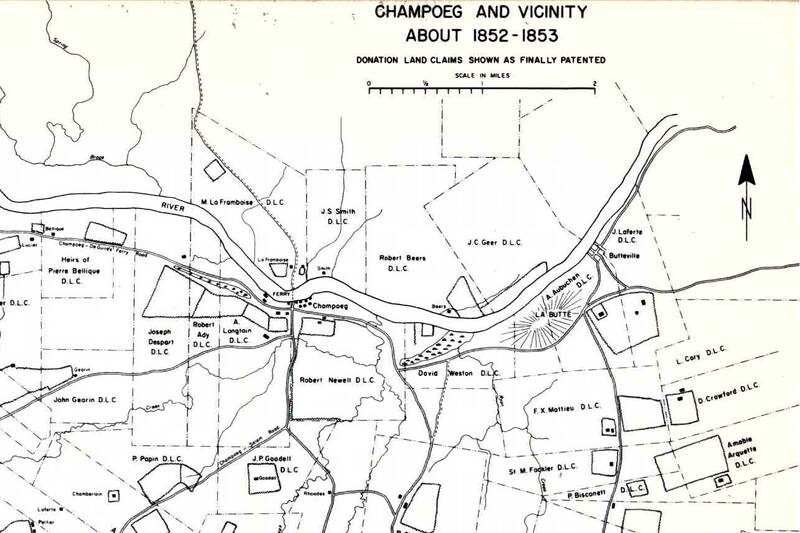 At this time the economy of the Butteville area funneled through Champoeg. According to Hussey, drawing on records of the Hudson Bay Company, farming by the retired HBC employees was made possible by the advance of materials by Chief Factor John McGoughlin in the early 1830’s. This advance was made in the form of a loan that had to be repaid for production above sustenance. Thereafter the surplus had to be sold to HBC, and by 1837 farmers in French Prairie were selling over 5,500 bushels of wheat to the Hudson Bay Company. That grew to over 10,000 bushels in 1843, from which the Hudson Bay Company started an export market to Alaska and Hawaii. This commerce was driven by the arrival on the upper river of stern-wheelers which replaced canoes, keelboats and flat boats. By 1851, more than 60 ferry and steamship landings existed on the upper river above Willamette Falls. Canemah (just upstream of the Falls) became the shipbuilding center for the region. Between 1851 and 1878, 27 steamships were built in Canemah to transport wheat, beef, agriculture, and timber products of the Willamette Valley to distant markets in California and the Pacific. 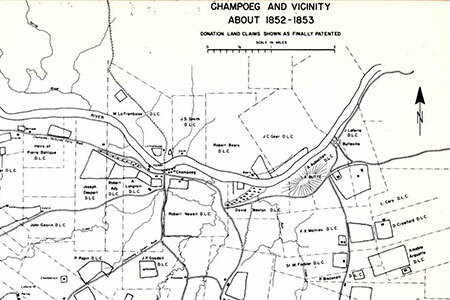 The rivalry between Champoeg and Butteville was resolved in the Great Flood of 1861 when Champoeg was washed away, while Butteville (sitting higher above the river) though damaged, was spared, and then became the central river port. 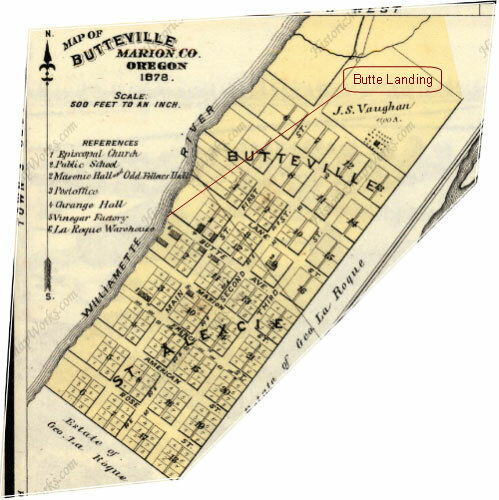 Butteville continued to prosper as a large shipper of wheat, hops, and other agricultural products through 1871 when the Oregon & California Railroad (the so-called eastside line) extended from Oregon City through Canby to Aurora, and then on to Hubbard, Woodburn and into California. Over time more and more of the town’s agricultural production was transported to Aurora and shipped by rail. Then in 1907, the Willamette & Pacific Railroad (the so-called westside line) crossed the Willamette River at Wilsonville and had stops on Arndt Road, Fargo and Donald. The result was the end of the stern-wheeler era and all products were shipped by rail. The year the first railroad crossed the Willamette River to French Prairie, Oregon produced 16,377,000 bushels of wheat and 13,000,000 bushels of hops. Most of that production occurred in French Prairie, and a large percentage originated in the immediate area around Butteville (source: 1905 US Agriculture Yearbook). Butteville was originally platted as two towns: St. Alexcie and Butteville because the Donation Land Claim boundaries of Aubuchen and Laferie ran right through the middle of the town. The plat map of Butteville above pictures a town platted with home sites, as well as an Episcopal church, public school, Masonic hall & Odd Fellows hall, post office, Grange hall, vinegar factory and a warehouse carrying the name La Roque. 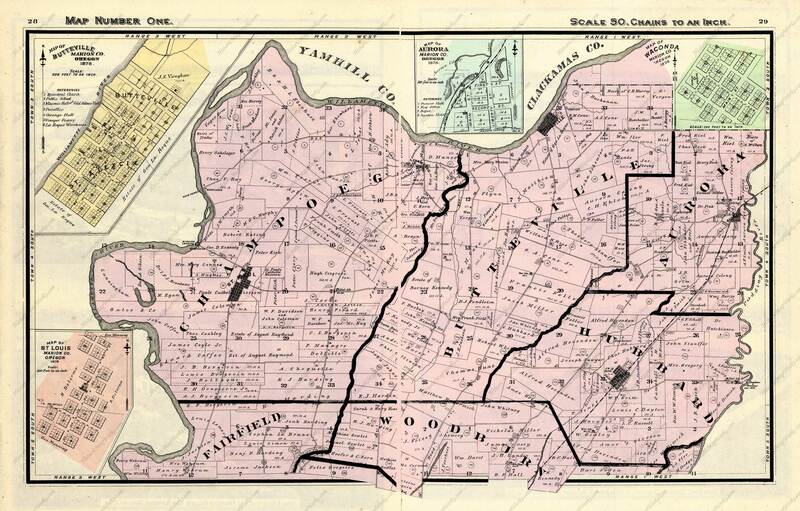 Butteville and its surroundings were large enough in population and economic impact that the 1878 map of Marion and Lynn Counties actually shows the town as the anchor for the Butteville Precinct of Marion county. The town of Butteville continued to grow and thrive along with the rapidly developing agricultural economy, so that by 1884 the town had a post office and school district, and was described as follows in the Oregon, Washington & Idaho Gazeteer and Business Listing. It is touted as the “centre of a rich farming and agricultural section of country and ships grain, hops and apples.” The listing detail “stages to all surrounding points tri-weekly,” which suggests that it was the civic and business hub. Having it’s own postmaster and “Mail, tri-weekly” further confirms the town’s importance at the time. A historical anomaly is also shown, in that JJ Ryan purchased what became the Butteville Store from George Fleckenstein in 1871 or 1872, and assumed ownership in 1887 when an ownership deed was confirmed the sale. See more information on the Butteville Store page. 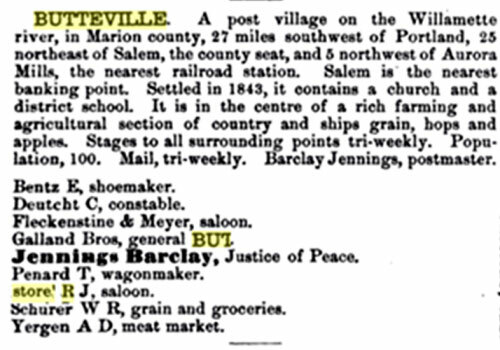 Another fact missing in the Gazetteer listing is that in the late 1800’s, Butteville had become one of the centers of hop production and shipping in Oregon. North French Prairie had many hop farms, and Oregon was the nation’s major hop producer. Learn more about hops in the history of Butteville and French Prairie on the Hops Page. Francis X. Matthieu was not only an early town resident, local farmer and “merchant,” but was also one of the voters at The Divide, the vote in 1843 at Champoeg for Oregon to align with the United States vs. Great Britain. He is memorialized on the monument at Champoeg Historical Area to that end. 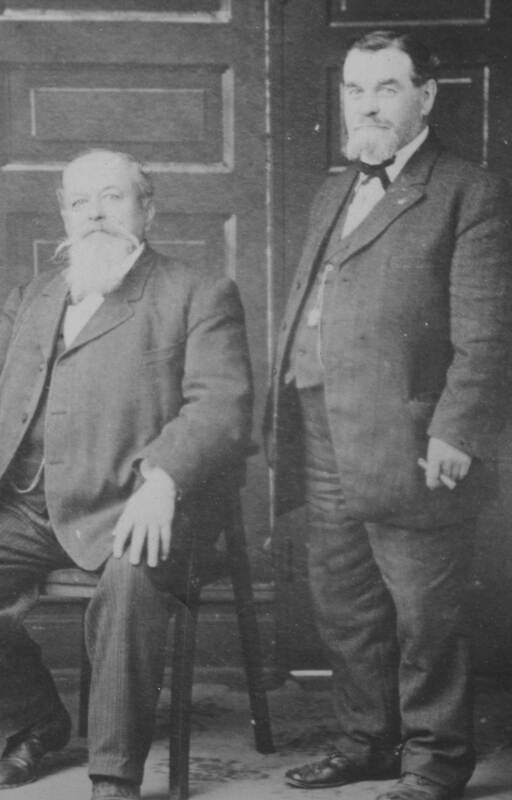 He was also arguably the most important person in the early commercial development of the town of Butteville. After acquiring what is now the Butteville Store, Joseph J. Ryan became instrumental in the later commercial development of Butteville, expanding the Store as a general mercantile, as well as dealing in grain and hops. As commerce moved from stern-wheeler to railway, Butteville became another agricultural community in French Prairie, rather than the principal shipping port on the upper Willamette River. 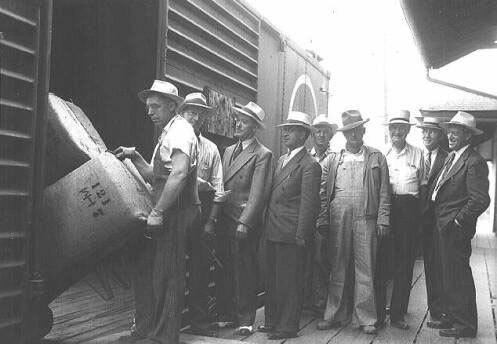 Hop and wheat production still continued apace, but with the convenience of rail shipping which was faster and less expensive that shipping on the river, the transportation role moved to surrounding communities. By 1938 the road down to the landing have become overgrown, and the town had a bucolic and rural air. For more information on the Butteville Landing and shipping on the river, see the Landings page. 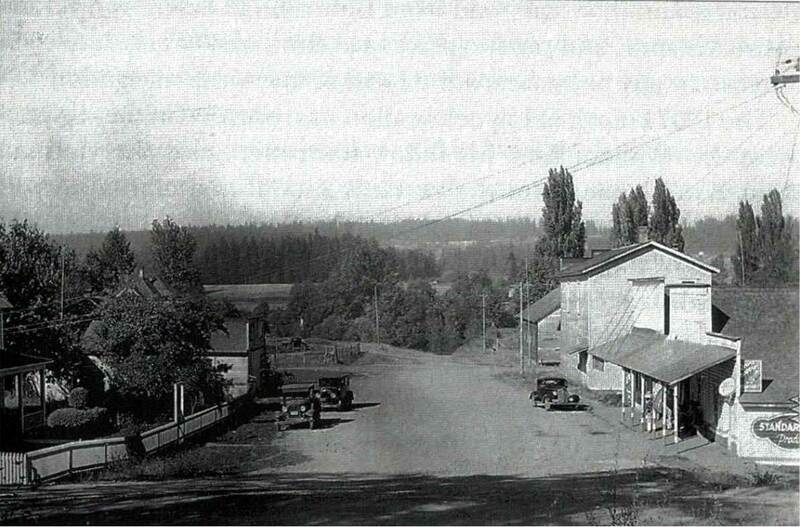 During the 1950’s and ‘60’s, and into the current century, Butteville has continued as a rural community. It’s proximity just south of Metro Portland has made it attractive as a place to live outside the urban scene. 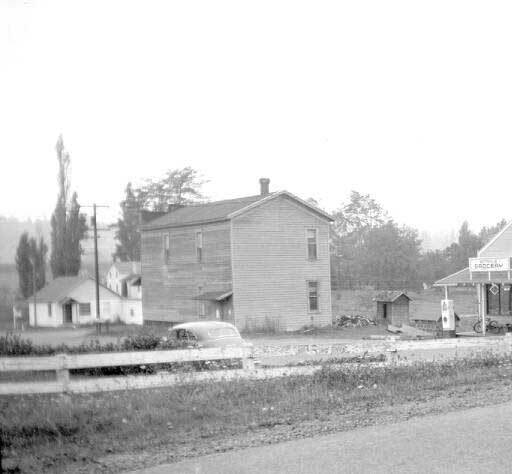 The Butteville Store in 1961 with the IOFF hall to the north. As Champoeg State Park expanded to reach Butteville on it’s east end via hiking trail, the town has become more connected to the Park. The Butteville Store was donated to Oregon Parks and Recreation Department in 1999, and is now operated to serve both the community and park visitors.